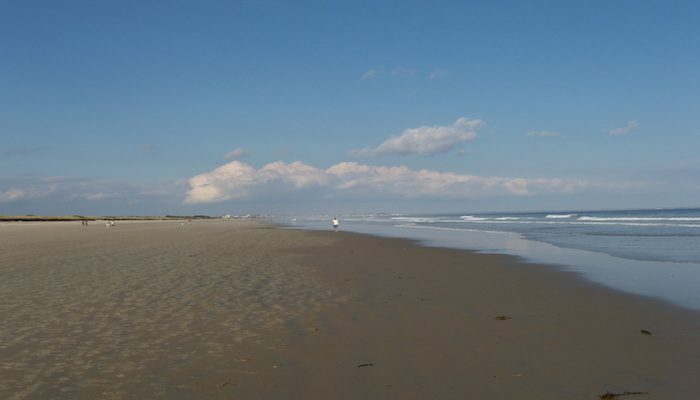 Ogunquit is one of our favorite beaches for running in New England. It’s long, wide, flat, open, and has consistently good “beach running” conditions. Ogunquit Beach is in southern Maine, about a 1.5 hour drive north of Boston and 1/2 hour south of Portland. The beach is almost always runnable, except for at high tide. As soon as the water starts slipping back, go for it! The run is about 2.4 miles one-way, from just south of Beach Rd., heading north toward Wells. North of Furbish Rd., the beach gets a little rocky. There are numerous access points to the beach, between Ogunquit and Wells. There’s a great 5-mile “Lobster Dash” beach race in September. All finishers get a lobster roll! More info. Parking: Paid, next to beach, or off Beach St. just before the bridge over River Rd.